Prospect Park Track Club offers a variety of training programs to help their members achieve their running best. Whether you are looking to complete your first marathon, qualify for Boston, recover from an injury, or tackle an Ultramarathon, we are here to help! Want to get faster, stronger and more efficient in your running? Do you want to improve your running form, learn more about injury prevention, stretching and strengthening drills? Coach Tony Watson and assistant coach Charlene Kohler-Britton offer a 7 week speed work session that includes all the above, and more! Each session will be 1.5 hours. Sessions are offered for experienced/faster runners (Tuesdays) and beginner/slower runners (Thursdays). Each week a suggested training program will be sent by email after each session. Each includes a program for those runners training for 10K distance and under, as well as a program for those who are training for half to full marathons. Attached here, you will find the Info Sheet that we need each runner to complete, even if you’ve run with the coached speed program before. Please carry it with you for your first session and we will collect them before we begin. If the speed workouts are new to you, please bring your race history (2015-present). Again, we wish you a warm welcome and look forward to working with each of you. Run with speed and power! Getting your body strong now will not only make you durable for your 2019 training, it will also make you more powerful and efficient, resulting in speed, better recovery, and reduced risk of injury. These Tuesday evening classes will consist of an hour of strength training that will progress and evolve as the weeks and months go on. It will first focus on base strength and mechanics before shifting towards increasing specificity & functionality. Runs April through July for a total of 10 classes. All classes meet on Tuesday evening at 7PM in Prospect Park. Available to PPTC members only. There are no partial refunds for missed classes. The club is happy to announce that we will be partnering with RunSMART again this year to provide custom training plans for the upcoming fall marathon season. The plans will be adaptable other fall marathons, but the baseline goal race will be the New York City Marathon. In conjunction, we will be meeting on Tuesday mornings to do group workouts led by your team captains. Workouts will be shared on Facebook and on the Google Group every Sunday evening. We will start at Grand Army Plaza at 6AM on Tuesday, then warm up down to Lakeside. If you live on the southern side of the park, feel free to meet us by Lakeside at 6:10AM. Please note that we will be starting speed work at 6:10AM sharp, so make sure you've already warmed up! You do not need to purchase a RunSMART plan to participate in the Marathon Training Group workouts – they are open and free for all members. If you’re training for a spring marathon, connect with your other club members on facebook or the Google Group! We are excited to announce that for spring 2019 the PPTC Ultra Marathon Training Group will once again target Rock the Ridge 50 Miler in upstate New York on May 4th, and the Dirty German 50 miler and 50k in Pennsylvania on May 11th. If you are interested in joining us on this journey, please fill out the signup questionnaire by December 24th. We will begin training on January 1st. No trail experience is required; however, we strongly suggest that those interested have at least 7 hours/week for training during peak volume (starting roughly 8 weeks before the race), have completed a marathon some time in the last year, and have an incoming base in January of around 20 miles/week. That being said, if you're determined to toe the line, we'll do our best to get you to the finish! The UltraMTG group will be similar to the PPTC Marathon Training Group format. Participants will get weekly, online training schedules via TrainingPeaks. We will also have 4 clinics during the season to address a variety of helpful topics, such as: nutrition, gear selection, mental strategies, race planning, etc. For runners who are training for a spring marathon and planning to run one of our target races after, please still fill out the form and list your marathon under the upcoming race section. Registration is now closed. Stay turned for the next training cycle! It's the whole reason you looked us up, right? 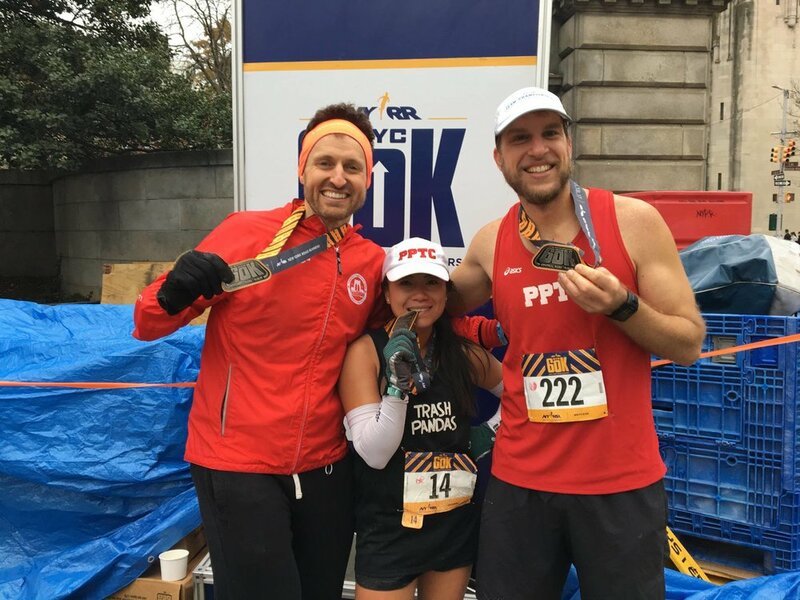 Prospect Park Track Club is happy to provide its members with a few special services for the New York City Marathon in 2018. Prospect Park Track Club will organize a group run of the last ten miles of the NYC Marathon course on Saturday October 27, 2018. We will meet under the 59th Street Bridge at 1st Avenue at 8am. This event is free, but is for PPTC members and their invited guests only. At the "finish line” (the Tavern on the Green parking lot) there will be more goodies waiting for runners. However, we will not have aid stations set up along the course, so be sure to bring a water bottle, some money, and a Metrocard. For those running the marathon, this exercise is crucial. In a few days, you will be running this same route after covering 16 miles. You will have the memory of how easy and fun it was with fresh feet and how close you are to the finish line. This is also a great run for someone who is not running the NYC Marathon – a way to have a taste of the excitement. Note: while this run is free, registration is required so we can organize pace groups and post-race goodies. The bus is now sold out. Thank you to everyone who registered, and happy training! Buses will be leaving from JackRabbit Sports in Park Slope and will take you directly to Fort Wadsworth. JackRabbit will be providing a bathroom, a place to be warm and dry, and the opportunity to purchase any last minute items. If you are taking the PPTC bus, you will need to be in front of JackRabbit Sports around 5:15AM to be checked in. The last bus leaves promptly at 5:45AM The cost for bus transportation is $15 for PPTC members and $20 for friends. All seats are prepaid and go quickly, and reservations are required. We also offer bag check so you can have clean, dry clothes and other belongings waiting for you at the PPTC post-race reunion. Bags (small ones, please) will be driven from JackRabbit to PS 87, so if you need anything at Fort Wadsworth, don’t put it in the bag! Please make sure your name and phone number are on the outside of the bag. After the race we have our own Marathon reunion area. You can meet your friends and family at PS 87; it is just 2 blocks from the finish line. We will provide hot chocolate, fruit, cold soda, bagels and an indoor restroom with a place to change. This event is free and open to PPTC Members and their friends who joined us on the marathon bus. We just ask that you let us know if you are going to join us so we can buy enough snacks. If you checked a bag at JackRabbit, it will be waiting for you at the school. We will be waiting at the school until about 6 o’clock. Directions to PS 87: after you finish the marathon, exit the park at West 77th St. Walk past the museum, cross Columbus Avenue, and the school will be halfway down the block on your right side. We will be entering through the playground not the front door. (You should see a club banner outside). If you’re not running the marathon this year, this is a great way to be involved and help your teammates and friends! Check your inbox to find out how to volunteer on this day.